Social Selling: There’s a lot of it about. 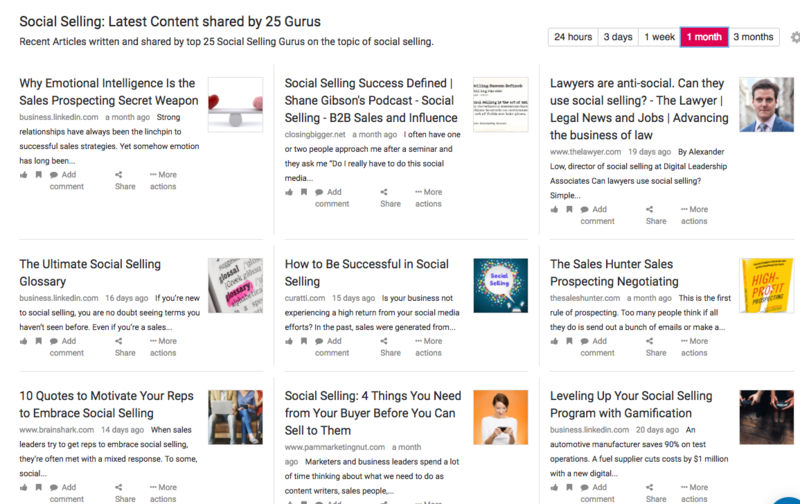 Last year over 5,000 articles were written on social selling. So who should you follow if you want to stay on top of the latest greatest tips and insights? 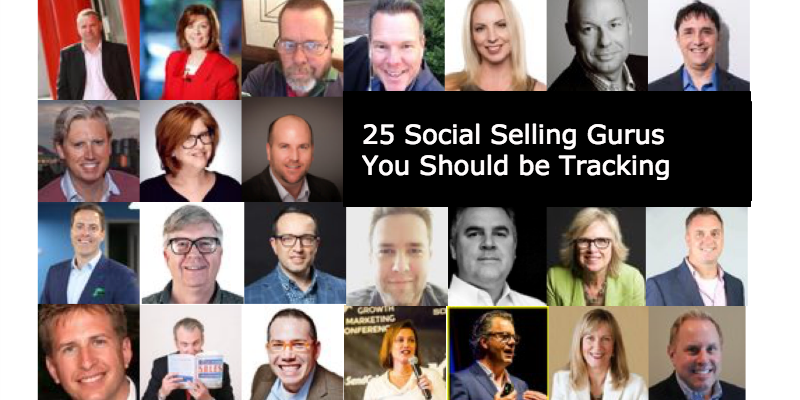 We’ve put together a list of 25 Social Selling Gurus that we think you should be tracking. We used the BuzzSumo influencer tool to identify the social selling experts who are well followed, have an engaged audience who share their content. We reviewed their social activity to identify who shares focused content on social selling, and who in our view are sharing valuable, original content, as well as sharing and adding value to other people’s content (as that’s what social sellers should do…). That’s not to say many others aren’t doing that too – let us know who else you’d add to the list. They all engage with their audiences. They reshare their content, they reply to questions and comments. They’re not just broadcasters. Great curators and sharers – they share other people’s content on social (often each others’). As one of the gurus puts it – 70% of what you share should be other people’s content. Several book authors – still a great way to establish credibility in a domain. Social Selling is about building authority and influence in your domain. Tim Hughes knows a few things about that. With over 193k Twitter Followers, Tim’s a global authority on social selling. He’s also the CEO and Co-Founder of Digital Leadership Associates (DLA). In the 15 Months since they were founded in London, from start-up to become the number one global consultancy for Social transformation programs. From C-Suite to sales, Marketing, HR, Supply Chain and more. Tim’s book “Social Selling – Influencing Buyers and Changemakers” has become the chosen Social Selling book for companies, universities and professional bodies. A leading author on all things social, Neal has written 3 books on social media and social selling. He helps followers with tips and tools on social selling and employee advocacy. Great insights on building your personal brand too – you don’t get to 185k followers without doing that right. Want the truth about social selling? You can handle it, and you should listen to Brian’s Brutal Truth podcast on social selling. Entertaining, and great guests sharing their own brutal truths on social selling. Dan’s matra is ““Approach every new connection like your next best friend and not your next sale”. Follow that advice, and follow Dan for great insights on social selling and building your network. Ok – a company rather than a guru. But LinkedIn is the main platform for B2B social selling, so it makes sense that their social selling account is worth following (even if it’s on, um, Twitter). Full of practical tips for making the most of LinkedIn and following their social selling model. Start with: The Four Pillars of Social Selling. Great model to get started with social selling on LinkedIn. Ken founded Inside Sales, a great lead generation platform. He takes a no-nonsense approach in sharing tips on what really works for lead gen and social selling. He’s also a big advocate of continuous learning for sales teams to stay smart and find great content to share on social. Start with: How To Prevent Sales Training Decay. Jill’s earned her reputation as a sales guru through numerous books, presentations and (of course) client success. Her site has a great range of free sales tools and resources for all stages of the process. Jack’s the co-founder of Creation Agency and is a prolific thinker and blogger on social selling: and how to make it pay off for sales teams – we particularly like how he thinks in terms of teamwork for social selling. Shane was ranked in the top 5 of Social Selling influencers by Forbes. He wrote Sociable: How Social Media is Turning Sales and Marketing Upside Down. Check his Twitter account and his podcast on selling which has been going since 2005. Jill helps startups and larger businesses grow through social selling and digital transformation. She’s been writing about the role of AI in sales, and a great person to follow if you want to stay on top of the tools and tech that’s becoming more of the social selling landscape. We just attended a fantastic debate that she led on social selling. She really knows this stuff. Perry hails from the Netherlands. As the founder of Social One he helps sales teams make more impact with their social selling on LinkedIn. If there’s a queen of sales tools, Nancy Nardin’s wearing that crown. Founder of Smart Selling Tools she shares great advice on the right tools and tech for social selling teams. Kevin has been a social seller long before we were all calling it that. He’s a prolific blogger sharing practical tips for sales pros to help work social selling into your daily routines. Continuing and concluding this miniseries of Kevins, Kevin Knebl is a regular speaker on all things social selling. Check out his book on the Social Media Sales Revolution. Phil’s podcast on Selling with Social where he interviews sales professionals is a great addition to your social selling playlist. His company Vengreso helps sales teams with social selling bootcamps and support. Start with: You Can Do Better Than “Congrats on the New Job. I Hope You’re Well”. Like several on this list, Barb’s got a great book on Social Selling – The New Handshake: Sales Meets Social Media. She runs Social Centred Selling, supporting social selling teams. Another avid podcaster, blogger and generous sharer. Start with: Should Sales People Create Their Own Content? We really like the 70/20/10 rule in here – 70% of the content you share on social selling should be external third party content, don’t just promote yourself. Here’s a variation on that theme. Mike’s the founder of Next Phase Selling. He shares plenty of content on the rise of social selling, what it means and what it doesn’t. He also shows his expertise on future technology with his posts at FutureRant. Brynne’s another one of the team at Vengreso and a social selling pro in her own right. Her book, The LinkedIn Sales Playbook is full of tips for social selling on you-know-where. Start with: Social Selling Isn’t Very Social, Is It? Like Barb’s post above, Tim makes the point that you have to get beyond sharing your own content and actually help people learn from the market by sharing a wider range of content. Jamie’s bringing the sales world from analog to digital. Another published author, do check out Social Selling Mastery. His company Sales for Life provides training and a great set of resources for social sellers. A great site to bookmark. Start with: How to Create A Social Selling Routine (Ebook) – simple but effective way to build social selling habits. Mic is another European expert, based in Belgium. He helps businesses grow through social selling with his company Vanguard Leadership. Another regular sharer with insights on social selling via LinkedIn. Start with: How To Ignite Your Social Selling Via Your LinkedIn Company Page. Andrew’s a principal at Volterra, who help clients grow their social media and social selling presence to get results. He’s a regular blogger on how to engage, curate and get results through social selling. Matthew’s another of those generous sharers – he curates a lot of great content on social selling, as well as writing his own over at the Knowledge Enthusiast blog. Start with: The A to Z of Social Selling. C is for Content. But you knew that. Brian’s had years of experience at Dell and many other companies running sales teams, making social selling and delivering results. If you want a no-nonsense conversation about social selling in practice, you should talk to him. We did. It helped a lot. Start with: What is Social Credibility? You could (and should) follow all of these people on Twitter and LinkedIn. But if your social feed is anything like ours, their great insights will be mixed in with everything else, so it’s hard to filter it. A Twitter List helps, but you’ll still see content from these experts if it’s not about social selling. So how about something more focused? Here’s a Constantly Updating Feed of Everything These Experts Share About Social Selling. We filtered by topics “Social Selling”, “Social Seller” and related terms, so we only see content on our core topics, and filter out everything else. So now when these experts publish or share content about social selling, you’ll see it all in this one place. It’ll update every few hours. You can filter it by time period to – go back 3 months or just see what’s come through the last few days. You can share content directly to social networks from here too, or save the best content. Hope it helps you stay on top! And let us know who you’d want to add to the list, and the briefing.